If you have trouble hearing God speak, you are in trouble at the very heart of your Christian experience. Reading over some of my past posts in regards to my former church, I have wondered how any one of the members, who used to read here from time to time, would feel about what I have written. Would they feel that I have been judgmental and condemning? Hmm. If the same came from God directly they would say they were convicted by the Spirit. The deciding factor is between the two is not in who is giving the message, as throughout time God has used people to deliver His messages, but from whom did the message come, my Lord or me. Should we expect all of God's messages to come from the pulpit through ordained ministers while we are sitting in pews? The problem is that if others are not hearing Him, then they would most likely think that I was acting on my own and not under my Lord's direction. Opposition in such a case might be the right response, but if I was acting in obedience to my Lord, then why would there be opposition from fellow believers? I initially opposed my husband when he first announced that we would be doubling our tithe for six months once to church board members. I was far beyond just being reluctant and I really did not want to hear my Lord say to do it, like a bratty child wanting my own way, but after seeking my Lord's heart in surrender to His will with faith in Him of the things I could not see, I was given confirmation from my Lord directly. I realized then that my husband was acting in obedience to a calling from our Lord and my opposition came out of out of my fear and not listening to my Lord on the issue at that time. I would have been in disobedience to Him to further oppose it or even resist by complaining, instead of embracing it in faith and trust, and many things happened during that time about which I could have complained, but what a blessing we received in the last month of that commitment, a job offer with an increase of 50%! I wonder though, if God is not being heard, what do people think He would do to get His message out to be heard by the people? I cannot count the number of times over the years that I have given advice to different people and they did not choose to follow it...until later when they either thought it was their own idea or some stranger told them the same thing—and they even forgot that I had given them the advice in the first place! Now imagine how it is when God is trying to get us to listen and we are not hearing Him; don't you think He just might use another person to deliver the message? I do not always hear my Lord or I question what I have heard and that is why I have prayer partners, ask for intercessors to pray for me, ask the Lord for confirmation through them and signs, and have faith with expectancy that His message for me will be delivered. And because I truly wish to be in His will, if I have displeased my Lord with disobedience, I want Him to convict me...I, of course, would like to escape the judgment though. 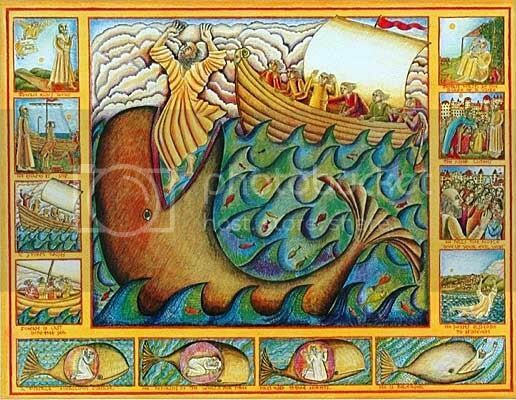 Jonah's battle with God over Nineveh has been on my mind much lately. I have been comparing myself to Jonah as the reluctant message-bearer. I really did not want to confront fellow believers, but God kept laying it on my heart how He wanted the church to change. When the prophets were giving God's messages to people who would not hear, a judgment would follow. I just do not know how prophets did this! It breaks my heart. Even after we left, I really wanted to see my Lord's will be done within and without the church. I am human with my frailties, but I did not want to be like Jonah, expecting a judgment regardless of any change or even no change. There has been changes within the church just due to our leaving, but the question is if the changes they are now making are in obedience to the Lord or if they are just for survival under judgment? Are they now hearing God or continuing to do what they think is right in their own eyes? If survival of the church is the priority, what has it replaced? If only we had used one/tenth of our efforts, resources, and resolve to save the unsaved as we had to save the church! Can the church survive by sitting in a favorite seat comforted by nostalgia of old hymns waiting for God to do something to keep it from dying off? If it isn't about saving souls, what is God's purpose for any church? Worshiping Him? Yes, absolutely that is a huge part. Praise and worship brings life to His Bride! And, shouldn't the church body ask God what kind praise and worship He would like within their particular church? Surely, He would know what He wants as well as what we need better than we ourselves do, right? It is far more than a social gathering, but a gathering to learn about God from each other and through each other as well. A place to come together in prayer, ask the Lord to work miracles, and experience miracles in our midst. When did God tell us to no longer ask Him for complete healing when we have an illness or injury? It is a place that is to lovingly restore and comfort us when we are poor in spirit, to encourage and strengthen us in our beliefs and faith, and also challenge us to have an intimidate relationship with God so that we will hear Him and act in obedience. Because, if we are not hearing Him, how can there be complete obedience? Is it condemnation or conviction that I now write? That is the question and the answer is in who is giving the message. Seek the Source for the answer. If you cannot hear Him or question what you are hearing, ask for confirmation. Ask intercessors to pray and give you the message they receive. Hear God what has to tell you...then accept it and act on it. The bible is pretty clear. Unfortunately most Christians a. don't realise that & B. haven't learnt how to hear from God for themselves. It drives me nutty. This is your area of expertise more than mine. It seems to me we have been having cross-overs. Perhaps that makes us better supportive with each other's ministry. Support ~ & accountability. The church being what it is these days very few people have taken the sort of journey you & I have & consequentially few understand the perils of the journey. It is a blessing to have each other.